(in Polish) various authors (1962). Marian Filip; Mikołaj Łomacki, eds. 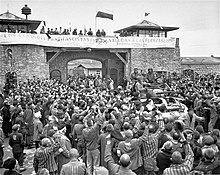 Wrogom ku przestrodze: Mauthausen 5 maja 1945 [Enemies Beware; Mauthausen, 5 May 1945]. Warsaw: ZG ZBoWiD. p. 135.
various authors; Henry Friedlander (1981). 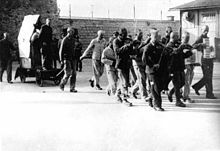 "The Nazi Concentration Camps". In Michael D. Ryan. 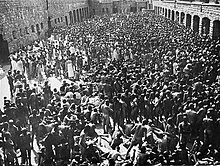 Human Responses to the Holocaust Perpetrators and Victims, Bystanders and Resisters. Lewiston, New York: Edwin Mellen Press. pp. 33–69. ISBN 0-88946-901-6. (in Polish) Various authors (2009). Andrzej Kunert, ed. 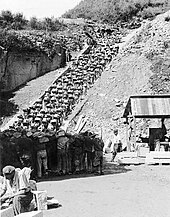 Człowiek człowiekowi… Niszczenie polskiej inteligencji w latach 1939–1945 KL Mauthausen/Gusen [Man to Man…; The destruction of Polish intelligentsia 1939–1945 in the camps of Mauthausen/Gusen]. Warsaw: Rada Ochrony Pamięci Walk i Męczeństwa. p. 104.
various authors (2008). Amy Schmidt; Gudrun Loehrer, eds. 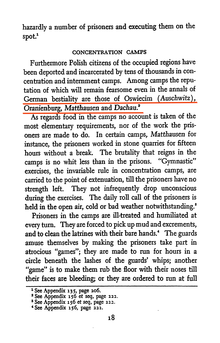 "The Mauthausen Concentration Camp Complex: World War II and Postwar Records" (PDF). Reference Information Paper. Washington, DC: National Archives and Records Administration. 115: 145–148. Retrieved 2013-09-23. (in Polish) Tadeusz Żeromski (1983). Kazimierz Rusinek, ed. Międzynarodówka straceńców [Desperados' Internationale]. Warsaw: Książka i Wiedza. pp. 76+19. ISBN 83-05-11175-X.